Ultrasonics. A subject with applications across all the basic sciences, engineering, medicine, and oceanography, yet even the broader topic of acoustics is now rarely offered at undergraduate levels. Ultrasonics is addressed primarily at the doctoral level, and texts appropriate for beginning graduate students or newcomers to the field are virtually nonexistent. 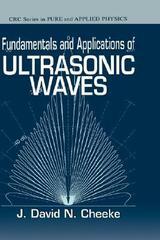 Fundamentals and Applications of Ultrasonic Waves fills that void. Designed specifically for senior undergraduates, beginning graduate students, and those just entering the field, it begins with the fundamentals, but goes well beyond the simple, general concepts of waves to a detailed treatment of ultrasonic waves in isotropic media. Addressing a wide range of topics, the author focuses on the physics of acoustic waves, their propagation, and the different modes that can be excited in various geometries. Strong emphasis on applications in the later chapters provides a concrete setting for the more formal and theoretical earlier discussions. Your search for the right introduction to ultrasonics is over. The clear, engaging prose, careful balance of theory and applications, and rigorous but accessible mathematical treatments in this book combine to build a solid foundation either for practical work in the field or moving on to higher-level studies.